Ethno Travels is the blog of a French travel consultant and blogger passionate about the traditional festivals and cultures of Asia, especially India, and the Basque Country. Why I'm involved in sustainable tourism? So, what is sustainable tourism? What do I do to promote responsible tourism? As far as I can remember, I have always been fascinated and attracted by the other cultures. Asia appeared to me as a distant, enigmatic and inaccessible place. In 2007, I made my first solo trip to Indonesia and quickly understood Asia would be my new playground. I was so fascinated by the culture that I couldn't travel elsewhere anymore. Have a look at the world map of my trips here. My 10th travel to this continent, in 2012, made me meet the Tribes of Indian Bastar - Chhattisgarh - during the World's longest festival, Bastar Dussehra. Travel blogger for 10 years at that time, this trip was a click. A few months later, I collaborated with Chhattisgarh Tourism Board to promote the Tribal culture of the state and started wondering how I could use my experience of blogging and my expertise in management and customer relationship to help the local people. My second trip to Central India to learn more about Bastar Dussehra and discover Gussadi festival in Telangana gave me the solution. My daily media coverage and a conference I made in a private school made me realise my impact in Central India and on sustainable tourism in India. I took benefit of my interviews to talk about my love and respect for Adivasis and the traditional cultures. I began to be recognised as an influencer on sustainable tourism and decided to create my own company to help the tourism companies to grow and develop their services in a sustainable way. Unesco defines sustainable tourism as a “tourism that respects both local people and the traveller, cultural heritage and the environment. It seeks to provide people with an exciting and educational holiday that is also of benefit to the people of the host country." So what does it mean for the travellers and the companies involved in Sustainable Tourism? RESPECT is an important component of Sustainable Tourism. That means we all have the responsibility to protect the locals and their cultural heritage. Two examples: during Bastar Dussehra, some Indian tourists put the sacred hats of the Bison Horn Marias on their head and made fun of them. 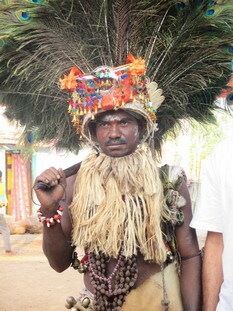 I asked my local friends to explain Adivasis - indigenous people - they could and even should refuse people to touch their sacred headdress (because of the caste system, Tribal people tend to feel inferior). I never give the information about Gussadi festival. I don't care if I lose readers. 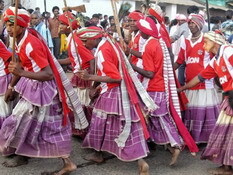 It's our responsibility to preserve such traditional events from mass tourism. That also means Sustainable Tourism is not a way to make more benefits for a company. Sustainable Tourism shall also have an impact on the local economy and benefit the locals. Travelers are not naive and they are able to recognize a company that is really involved in Sustainable Tourism. Cheating is just a very short-term strategy, especially at the time of social media. Companies shall think LONG-TERM and HUMANS for their whole strategy. Sustainable Tourism is much more than taking a few actions to protect the environment. I use all the occasions to promote sustainable tourism as it can be as simple as saying how much foreigners are interested in discovering the traditional cultures or communicating the program of my trips. Each time I talk about a special festival I'll cover, I know I'll be contacted by some people who want to know more and see it also. As a guide and guesthouse owner, I help English-speaking foreigners to discover the rich culture and the beauty of the touristic Basque Country where I live and the travellers to organise their trip in the places I've travelled to. Read more about my travel philosophy on the related page. It is very heart warming to see someone not from India, spreading love for India. I have always admired you for it and with this article, I know that I am not the only one. Thank you so much for sharing the brighter side of life in my country. You have taken travel to an altogether different plane and have been doing an admirable job, there are not many of your tribe, I can only say, may your tribe increase. What a perfect analysis of how one can be perceived by a group and how to leverage that trust to share their stories and positively influence a whole world of travelers. I particularly love that you’re able to share stories and broaden the views of children. It’s amazing when one can be respected and at the same time publicly promote a culture, both for awareness and to increase tourism in a dignified manner. One more reason we love following your travels and work. No hard work ever goes waste Stephanie. I love your passion and the beautiful work you do in my country while many people still think India is undeveloped and not worth their time. Appreciate your time and efforts! Come back regularly to read the articles of the blog, comment the articles to share your thoughts or ask questions.